Although you wouldn't know it from looking at my recent blog posts, I still like to do papercrafting. I haven't had much time or opportunity to bring out all of my supplies, but I was glad to have the chance to do a quick project from the FedEx Office Out of Office blog. I started thinking of the name Grace because of a special young lady whose birthday is coming up--but the word Grace is a reminder that I can use often! My bookmark will probably not last long, if I leave it this way. To protect it, I would take it to a store that offers lamination services (FedEx Office comes to mind, since their blog had this project idea) and have the bookmark laminated. I'm sure I would have to remove the ribbon and replace it afterward, but that's quick and easy to do. If you're looking for craft ideas--for you or for your children--take a look at the Out of Office blog to see what they offer! Disclosure: I wrote this review while participating in a blog tour campaign by Mom Central on behalf of FedEx Office and received the items necessary to facilitate my review. In addition, Mom Central sent me a gift card to thank me for taking the time to participate. 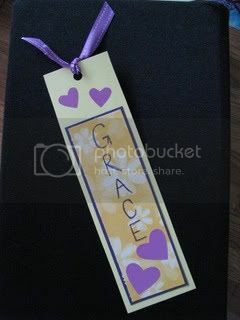 I love bookmarks, I am a bookmark nut...grace is indeed a good reminder. grace is something we ALL need to remember more often! This so cute and I will have to go check out that blog ;) Glad you found some time to papercraft! That's cool. We have laminated paper here, but I would love to get a laminator. I seen them at Walmart and they were not that expensive. Very cool I so need to get back into crafts.